It’s personally my favorite time of year as nature explodes with color and we get to enjoy cool, crisp mornings, firepits, football games, apple cider, pumpkins… I could go on and on! I also think its the prettiest time of year to sell your home. Think pots of mums, pumpkins, layering with pillows and throws, candles, a toasty fire and intoxicating autumn smells with hints of apple and cinnamon. How could a buyer resist? Here’s my tips that are sure to capture your buyer’s attention! The cooler days of Fall make it much more enjoyable to get out there and clean up the landscaping. Pull weeds, trim bushes and add fresh mulch. Don’t forget to clean your exterior lights, front door, porch and windows of cobwebs and dirt. Paint the front door. Clean your windows and screens. 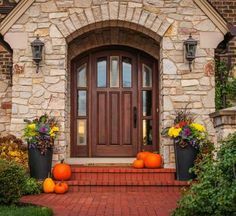 Add decorative touches of Fall with a new welcome mat, a pretty autumn wreath, pots of colorful mums and a few pumpkins. Let’s head inside and start creating cozy spaces for the season. 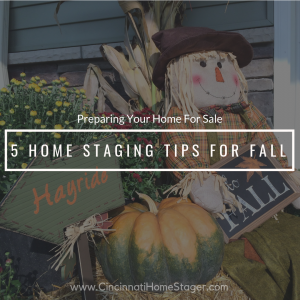 This is so important in helping your prospective buyers envision themselves living in those spaces and enjoying the cooler months. But also keep in mind, you want to be conservative with your fall decorations. Too much of a good thing can completely distract buyers from the selling features and layout of your home so sprinkle it lightly throughout. Think LAYERS. Add more pillows to the sofa and chair. This is a great time to purchase some new ones in fall colors and patterns. Break out the throws by draping one across the arm of the sofa and add several rolled up into a basket by the fireplace or chair. Add some harvest touches with a basket or tray filled with gourds, tiny pumpkins and pinecones. Adding something plaid to the mix always makes it feel like fall. Tie in unscented candles and lanterns and place them on the mantel, coffee table or as a centerpiece in the dining or kitchen. Yep, the days get shorter which means its getting darker earlier each day. Now is the time to make sure you have enough lighting in each room. 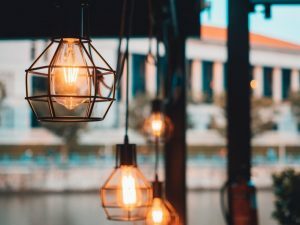 Change out any lightbulbs to a higher wattage if possible, add more lamps (don’t forget those dark corners), and make sure every light and lamp are on during a showing. If you have a gas fireplace, this is another perfect feature to have on. Fall brings so many wonderful aromas and adding a few to your home is easy. I highly recommend essential oils when selling because they are 100% natural and safe. Ditch the chemicals which include strong air fresheners and candles. Using these for showings or Open Houses can hurt your chance of selling a property. A year ago when we were searching for a new home, as buyers, my husband and I were very excited to see one particular home. When we got there, they had about 5 highly fragranced candles burning throughout trying to hide the dog odor from 2 of the large dogs stuck in the mudroom. It was so overpowering we cut the showing short and ended up with a terrible impression of the house. Plug Ins, Candles or Room Sprays…..just DON’T. Instead, use essential oils and a diffuser which you can purchase on Amazon, home stores or through an essential oils representative of doTERRA or Young Living. Last but not least, let’s talk about Halloween. I know a lot of homes decorate for Halloween early and its displayed the entire month of October. When you are selling though, I suggest shortening the Scare Decor to a week MAX. Then take it down by the next day. If you are one that loves to go all out for Halloween, at least this year, keep the decor simple. Cute is fine but keep the blood and gore packed away. There’s always next year. Your home needs to shine and features highlighted and you don’t want any seasonal decor to distract or turn off prospective buyers.